"An easy and delicious way to prepare green peppers as a main dish." In a large skillet or medium stock pot, brown the beef and onion over medium heat. Drain fat. Add rice, water, diced tomatoes, and stewed tomatoes. Season with salt and pepper. Simmer until rice is tender. Preheat oven to 325 degrees F (165 degrees C). Cut the tops off the bell peppers and clean out the seeds and membrane. (Note: You may have to slightly slice the bottom of the peppers to make them stand up.) Fill peppers with meat mixture. Place in a casserole dish and bake in a preheated oven for 20 minutes or until peppers are as tender as you like. Served topped with spaghetti sauce. HMmm...nothing special...still looking for that knock-your-socks-off stuffed pepper recipe. 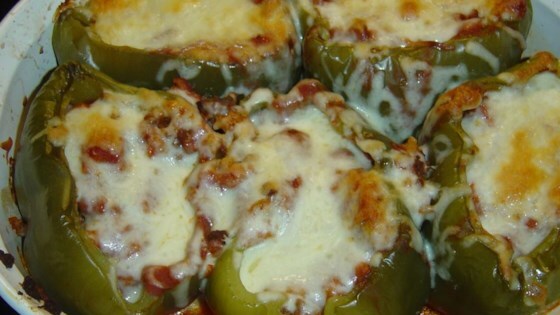 My entire family loved these stuffed peppers! After reading the reviews, I decided to add some garlic & chopped peppers to the filling and increase the baking time to 45 minutes. Perfect! This was a great recipe! I let the peppers bake an extra 20 minutes. Also at the last 5-10 minutes i added mozarella cheese to the top of each pepper! Wonderful! It was very good! I subsituted ground turkey for the beef and added a little italian seasoning and cheese on top. It was very very delicious!